The discovery of the Dead Sea Scrolls, left behind by the ancient Essenes at Wadi Qumran, in what is today the West Bank area, meant that an issue of faith suddenly became strengthened by facts. These scrolls not only affirmed the accuracy of many Old Testament books but ended much of the debate surrounding the historical authenticity of the Bible. The Dead Sea Scrolls caused heated controversy in scholarly circles over their date and the identity of the community they represented. Professor Eleazar L. Sukenik, an Israeli Archaeologist and professor at the Hebrew University of Jerusalem, after initially defining the time span of the scrolls as the Second Temple period, recognized their special significance and advocated the now widely accepted theory that they were remnants of the library of the Essenes. At the time, however, he was vociferously opposed by a number of scholars who doubted the antiquity as well as the authenticity of the texts. Today scholarly opinion regarding the time span and background of the Dead Sea Scrolls is anchored in historical, paleographic, and linguistic evidence, corroborated firmly by several carbon 14 dating’s, the first of which was conducted on a piece of linen in 1950 by Dr. Willard Libby, the inventor of the dating method. Several other tests were conducted by the Accelerator Mass spectrometry lab of the Zurich Institute of Technology in 1991 and the AMS Facility at the University of Arizona in Tucson in 1994-95. 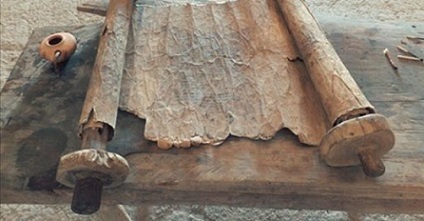 Carbon dating proved that the oldest of the scrolls dated to the Hellenistic era of the Second Temple, perhaps 250 years before the birth of Christ but the bulk of the material, particularly the texts that reflected on the sectarian community, are originals or copies from the first century BC. A number of texts date from as late as the years preceding the destruction of the Temple at the hands of Roman legions. The majority of the scrolls are written in Hebrew with a few fragments in ancient Paleo Hebrew thought to have fallen out of use in 5 BC. Others are written in Aramaic, language spoken by numerous Hebrews between the 6th century BC and the siege of Jerusalem. Others are Greek translations of Old Testament books. Most of the books of the Bible are represented in the collection. Some are extant in large number of copies; others are represented only fragmentarily on mere scraps of parchment. The biblical texts display considerable similarity to the standard Masoretic (received) text. This, however, is not always the rule, and many texts diverge from the Masoretic. Before the discovery of the Dead Sea Scrolls, the oldest known manuscripts of the Hebrew Bible dated to the 10th century A.D. The Dead Sea Scrolls include over 225 copies of biblical books that range from small fragments up to complete works of the prophet Isaiah and every book of the Hebrew Bible with the exception of the Books of Ester and Nehemiah, proving for all times that what we now call the Old Testament books were known and treated as sacred writings before the time of Christ, with essentially the same content. The fame of the Scrolls, often called the greatest archaeological discovery of the 20th century, has encouraged both forgeries and the shadow market in antiquities. Religious artifacts especially attract forgeries, because people want a physical connection to their faith. The so-called James Ossuary, a limestone box, that was claimed to be the burial box of the brother of Jesus, attracted much attention in 2002. A few years later, it was found that it was indeed an authentic burial box for a person named James from the first century A.D., but by adding “brother of Jesus” the forger made it seem priceless. In addition to the Biblical books we know to be accurate, there are numerous texts that have been discarded by religious scholars. The Book of Jubilee which claimed that Cain married his sister and described the life of Abraham similar to that found in the 7th Century writings of the Quran, is disputed by Catholics, Protestants and Jewish scholars who do not accept the date written or the authorship. The Shepherds of Hermas was written around the turn of the century or as late as the middle of the 2nd century and is attributed to a former slave. Some have even suggested it was written by a brother of Pope Pius I. The Epistle of Barnabas was written in Greek to Christian gentiles during the first century, based on oral traditions. It is presented as a lesson rather than a reflection on Christ and teachings of the early Church. The Apocalypse of Peter is presented as a discussion between Peter and Christ after His resurrection. Authorship is unknown but it was written around 100 AD. It describes the torment of the damned such as hanging adulterous women by their hair over boiling muck or forcing homosexuals to throw themselves off a cliff and made to repeat the process in an unending circle. The Book of 1 and ll Clement is believed to have been written by two separate authors describing the difficulties of the early Catholic Church. The 1st book was believed to have been written by an early Pope. The Gospel of Thomas, author unknown, is believed to have been written by a disciple of prophet Mani, the founder of a pagan religion known as Manichaeism, now extinct. Even Hippolytus of Rome found it to contain heresies. The Gospel of Peter was not written by Peter the Apostle. In addition to many errors, the scroll claimed that Christ did not die on the cross. According to Origen of Alexandria, this fragment was the source of Catholic doctrine of the perpetual virginity of Mary. The Book of Tobit is included in the Vulgate and Eastern Orthodox Canon but not accepted by Jewish or Christian Scholars. The Book of Enoch supposedly found in Cave 11 in 1956, as part of the Dead Sea Scrolls, is believed to be in the possession of private investors even though there is no direct evidence that it even exists. The book is controversial for numerous reasons but my favorite is the claim that the offspring of the fallen angels and the daughters of mankind actually ate mankind and drank their blood. One Chapter of the scroll claims that Enoch actually tried to intercede for the giants with God. The text, the earliest part of which dates back to 300 BC, to the last section which dates to the latter part of the 1st Century AD, is believed by some to be stolen from ancient North Eastern mythology. The name of one of the giants mentioned in the text, Gilgamesh, is actually taken from the Babylonian myths. Regardless of those texts listed above, the majority of the Dead Sea Scrolls support the veracity or truthfulness of the Bible. There were over 40 authors who wrote 66 books in three languages, yet the margin of error was less than 1%. Most of these errors consisted of minor spelling and punctuation differences and did not affect the context of the books.